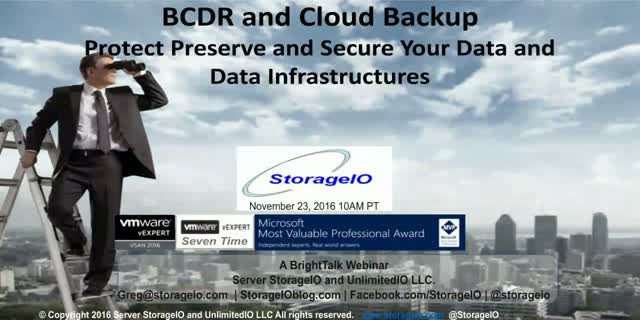 The answer is BCDR and Cloud Backup, however what was the question? Besides how to protect preserve and secure your data, applications along with data Infrastructures against various threat risk issues, what are some other common questions? For example how to modernize, rethink, re-architect, use new and old things in new ways, these and other topics, techniques, trends, tools have common theme of BCDR and Cloud Backup. Join us in this discussion exploring your options for protecting data, applications and your data Infrastructures spanning legacy, software-defined virtual and cloud environments. - Do clouds need to be backed-up or protected?